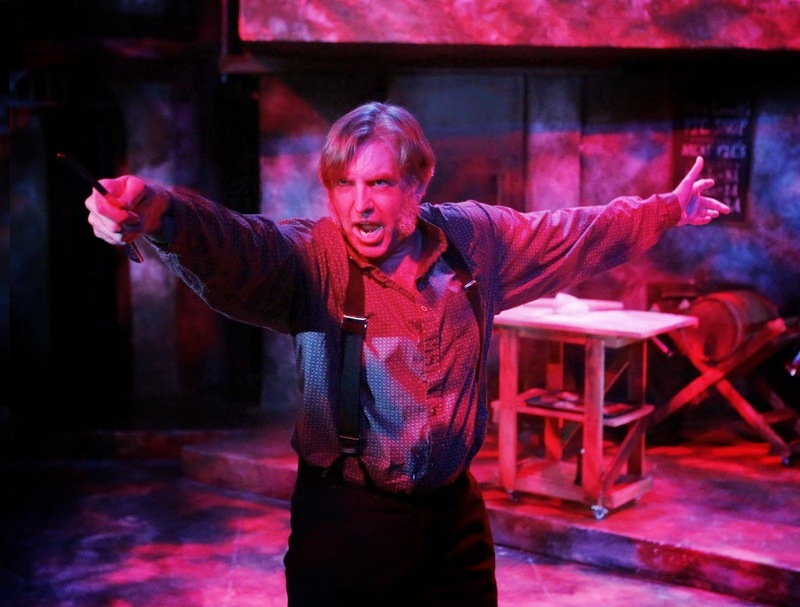 Christopher Chew hones his edge as Sweeney. I'll be honest: I found myself straddling a peculiar kind of critical fence as I watched the Lyric Stage's new production of Sweeney Todd. On the one hand, I disagreed with many of director Spiro Veloudos's choices. But on the other, I had to admit that more often than not, his show was working like gangbusters - largely because it features four remarkable supporting performances, a superb chorus, and in general showcases some of the most powerful singing I've heard on a local stage. Still, when it came to his vision of the leading duo of Stephen Sondheim and Hugh Wheeler's macabre classic, I had my doubts. In the Veloudos version, the eponymous "demon barber of Fleet Street" returns to London (after escaping an unjust prison sentence and a shipwreck) a broken man, but perhaps not yet a murderous one. Indeed, it took lead Christopher Chew most of the first act to rise to the level of vengeful obsession that Len Cariou telegraphed from the opening scene of the show's premiere (which, like many others, I happened to see all those many moons ago). But at the Lyric, Sweeney's razor-rampage was clearly a folie à deux of sorts - only half the mad pair in question wasn't nearly as crazy as usual. Instead, co-star Amelia Broome (below left, with Phil Tayler) pitched her Mrs. Lovett - who comes up with the idea of baking Sweeney's victims into meat pies - as something of a vamp; the addled housewifery of Angela Lansbury seemed very far from Broome's essentially calculating nature. This somewhat compromised the parody of bourgeois gentility that Sondheim & Co. (working from a text by playwright Christopher Hampton) had embedded in the script. (And in some ways it made Mrs. Lovett more horrible than Sweeney.) But it actually enhanced the action's ghoulish atmosphere, which the physical production only emphasized: Janie E. Howland's set was literally a grindhouse, and blood sprayed like geysers from Sweeney's handiwork; for the first time, this grisly fable indeed seemed "a thriller" (as its initial marketing had promised), rather than a burlesque of one. And at any rate, when a production is sung with this much power, I'm willing to forgive it anything. Broome seemed to struggle at first, but warmed up as things progressed; meanwhile Chew (an apt name, that, for this show!) reached a remarkable intensity as the chance of real revenge all but glittered before his baleful Sweeney. But both leads were often upstaged by a startlingly talented and committed supporting cast. To be honest, there wasn't a weak link in this crew - everyone seemed utterly at ease with the score's unique mix of patter songs (drawn in equal parts from Edgar Allan Poe and Gilbert & Sullivan) and sudden flights into the melodic stratosphere. But special praise must go to Sam Simahk's passionate Anthony Hope, Davron S. Monroe's foppishly over-the-top Pirelli, and particularly Phil Tayler's hauntingly crippled Tobias Ragg (which probably counts as the most memorable Tobias I've seen). And yet another set of laurels must go to the astonishing turn by Paul C. Soper as Judge Turpin. Soper's dramatic portrayal was as subtle as his vocals were grand - indeed, his Met-sized instrument proved so powerful I sometimes wished he'd modulate down in the ensembles. Still, I can't quibble with the kind of performance that can send a shiver down your spine (and I don't think you will, either). 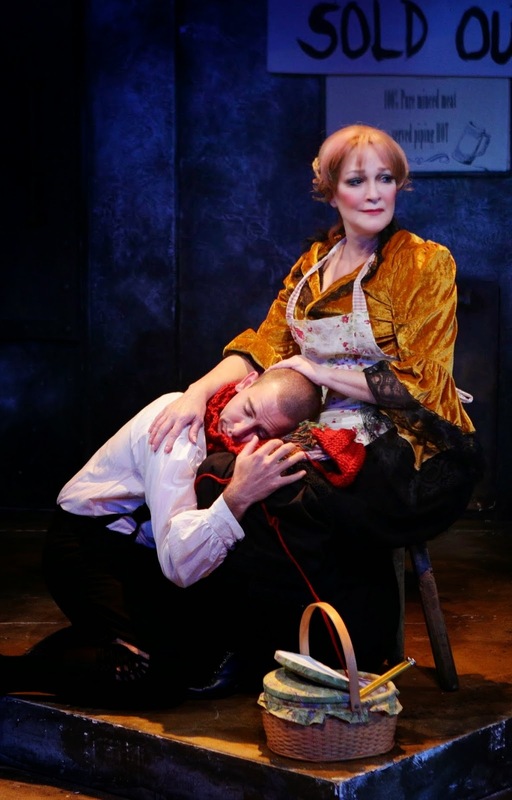 And while the action was sometimes a bit squeezed on the Lyric's intimate stage, Veloudos and company managed many a theatrical coup anyhow: the steaming oven center stage will stay with me for a long time - as will Pirelli's bloody descent into Sweeney's trunk. And I have to mention that this is the first time I've seen the sudden appearance of the Beadle's body in the grindhouse greeted by a genuine scream from the audience. On the other side of the ledger, there were a few vocal/instrumental balance problems - but with proper attention those should soon be corrected; likewise here's hoping the Lyric's talented music director, Jonathan Goldberg, will ease up on the gas on a few numbers ("Kiss Me" in particular), which on opening night were taken at such a clip that they got blurry even for someone like me, who practically has the lyrics memorized. The evocative lighting was by Franklin Meissner, Jr.; the apt costumes, by the reliable Rafael Jaen. I left the Lyric, I admit, in occasional disagreement with its director; but I could never deny his production's power. In fact I doubt anyone could.